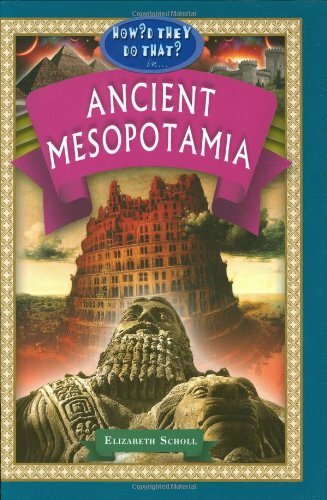 Elizabeth Scholl's work Ancient Mesopotamia is an excellent introduction to Mesopotamian civilization for children. Part of the How'd They Do That In...? Series, Scholl's book begins with a story of a young girl named Kammani going to visit the doctor in the ancient city of Ur. The story is fictional but the details presented are historically accuracte. Following the story a reader is introduced to the system of government, home and family life, schools, types of food and festivals, and important figures such as Gilgamesh and Enheduanna. There is a section at the end where one may learn to write in cuneiform, view a timeline, and look through works consulted and works for further reading. The illustrations throughout are colorful and engaging, the prose is clear and interesting, and the history presented is accurate and accessible. Highly recommended for young readers or for anyone who wants a quick and enjoyable introduction to ancient Mesopotamia. Mark, Joshua J. "Ancient Mesopotamia (How'd They Do That in)." Ancient History Encyclopedia. Last modified December 26, 2013. https://www.ancient.eu/review/40/. Mark, Joshua J. "Ancient Mesopotamia (How'd They Do That in)." Ancient History Encyclopedia. Ancient History Encyclopedia, 26 Dec 2013. Web. 20 Apr 2019.